Rhode Island, our littlest state. A couple of weeks ago I mentioned that I would be writing about Annicelli v. South Kingstown. Not a lot of people have heard of this case, except those of us geeky enough to spend our time reading regulatory takings law. Yet it’s an interesting case to think about today because, over thirty years ago, the state of Rhode Island grappled with issues concerning barrier beaches and flood zones that remain with us today. Ultimately, I think the case is a reminder that the very specific circumstances an owner finds himself or herself in determines whether a regulatory taking has occurred. Not all regulations result in takings, after all. What, you might ask, is a “regulatory taking”? Maybe we should back up… What is a “taking”? In its most basic form, a taking occurs when the government takes possession of privately owned land for public use. Under the Fifth Amendment of the US Constitution, such an event can occur, but the government is required to provide just compensation for the taking. Many states have similar property protections written into their constitutions. A regulatory taking happens when a regulation (zoning ordinance, for example, or some other ordinance or law) takes the value of privately owned property even if the property itself remains physically in the possession of the owner. The regulatory taking is a legal category that, while the concept existed earlier, really emerged during the twentieth century. Moreover, in the late twentieth century, several different property rights movements developed the category in the law through litigation. We’ve had several important US Supreme Court cases involving the definition of a regulatory taking and how to determine when property has been taken through regulation. One of the most famous regulatory takings cases, Lucas v. South Carolina Coastal Council, involved the issue of how far a regulation could go in decreasing the value of private property before a taking had occurred. The U.S. Supreme Court found that, essentially, if a regulation takes away all economic viability, the courts will find a taking. At some point, I’ll write more about this. For the moment keep in mind that at the time it was decided, many thought it would be mobilized (i.e., used by activists) to deregulate land in many communities throughout the US. However, over the years Lucas has posed a special challenge to anyone who attempts to use it: it requires that the regulation totally wipes out the economic viability of the land. There can be no beneficial use left to the owner. It is rare that a regulation does this, but when one does Lucas does provide that plaintiff an opportunity to recover losses as a result. Buried inside the Lucas decision is a reference to Annicelli, which is really the topic of today’s post. When I began studying regulatory takings, I read right past it in the case (on that snowy, cold day I wrote about recently). Then, while living in Rhode Island, an environmental lawyer pointed it out to me. I went and hunted down the case, and quickly realized something that really should have been obvious to me already: state-level regulatory takings issues were both very widespread in the middle of the twentieth century and had long been an issue for state courts. In fact, reading through Annicelli, I realized that the Lucas doctrine had been a part of state law for quite some time. At the state level, however, the issue seemed a little more complicated because states have police powers to regulate for the health and safety of their citizens. The question, then, was where the line between a regulation for the public good and a regulation designed to prevent a public harm? This line matters greatly. For states, it is the line between a constitutional exercise of state police powers (which do not require compensation and are designed to prevent public harms) and an exercise of eminent domain (that do require just compensation as the property is being taken for the public use to advance the public good). This question became more complex in the twentieth century as scientific evidence mounted indicating both that the sea level was rising and that the coast was eroding. As state officials struggled with the realities of what this meant for the land, they began to experiment with state and local ordinances designed to protect what we now call wetlands and barrier beaches in the hopes of slowing down erosion, protecting property inland from sea surges, and providing protection from serious storms. In theory, these ordinances are generally designed to protect the public from a harm — in this case, storm surges and beach erosion. That states have the powers to enact such ordinances has always been true. But at what point does such an ordinance cross the line into the realm of eminent domain taking? Rhode Island is a little state — it’s about 37 miles wide and 48 miles long. Yet if you look closely at it (see the photo from Google Earth), you’ll see that relatively speaking, it has a lot of coastline: 400 miles, in fact. And, if you look at the maps you can locate here you’ll see that it is mostly watershed to one river or another. The maintenance of its coastline has long been an issue for this little state. After all, if its coast erodes it not only loses economic development possibilities, it loses land — that is, beach erosion means its territory is diminishing… And a state can’t exist without a territory to govern. Well, I suppose, in one’s imagination it could exist… But it won’t exist as a state in the United States. So the state does what it can to maintain that land as best it can both to protect its residents and to maintain its identity; and the communities along the 400 miles of coastline tend to make how that land is developed and what it is used for a priority in their policymaking in order to both advance economic development and protect their communities. In 1975, Ida Annicelli signed a purchase-and-sale agreement with the owner of real estate in Green Hill Beach. Her plan was to construct a single-family dwelling there. There are a lot of vacation homes in the area, and Mrs. Annicelli was, in fact, an out-of-state resident. The agreement she signed, according to court documents, stipulated that she would “relieve the seller of any responsibility toward successfully obtaining ‘all necessary buildings, sanitation, and coastal resources permits.’” Mrs. Annicelli did, in fact, file for the requisite permits to build a single-family dwelling. The purchase price for the land was $16,750. A map (with roads) of Green Hill Beach today — note that Annicelli purchased her land in 1975. The area would have looked different, but there would have been development in the area even then. In other words, the classification of the land as an HFD zone meant that Mrs. Annicelli would not be able to construct a single-family dwelling. In fact, the uses that were left available to Mrs. Annicelli included several possibilities such as “a horticultural nursery or greenhouse, a park or playground, a wildlife area or nature preserve, or a golf course or marina… raising of crops or animals, the storing of commercial vehicles, and the repairing of boats” (p. 4). Importantly, all these potential uses would have required a much larger tract of land that she had agreed to purchase. Also, there were 30 other homes in the area already. She was joining a small community, not attempting to build in an undeveloped area. The court noted that none of the uses the ordinance allowed were available to Mrs. Annicelli because the lot size was too small to make use of the land in these ways. Annicelli’s appraiser testified that he believed the land was worth very little because none of these uses were practical. The RI court quoted him as stating that, “the most anyone would pay…for a spot to sit on the beach to go swimming” was $1,000. And sitting on the beach, he strongly suggested, was the only use available to Mrs. Annicelli given the language of the ordinance. The town’s appraiser figured the land was worth about $8,500. According to the court, “he conceded that several of the uses were impractical while denying that Annicelli was deprived of all reasonable or beneficial use of her property.” There’s no indication that he had other ideas for her, so we don’t know whether he made other suggestions. However, given the court’s careful parsing of his testimony in their decision, I would guess that he simply did not want to concede that all reasonable or beneficial use of her property was gone because, under Rhode Island law, Mrs. Annicelli would have a valid claim of a taking. The aim of the HFD designation was to protect the barrier beach in the area. The Green Hill Beach, which is a barrier beach, stretches along the coast. Like all barrier beaches, it is a narrow strip of unconsolidated material made up of sand or cobble. It runs mostly parallel to the shoreline, extending to it and a little below it. Barrier beaches are formed through wave and current action. They are generally separated from the mainland by a swampy area or a a salt pond (sometimes a freshwater pond). 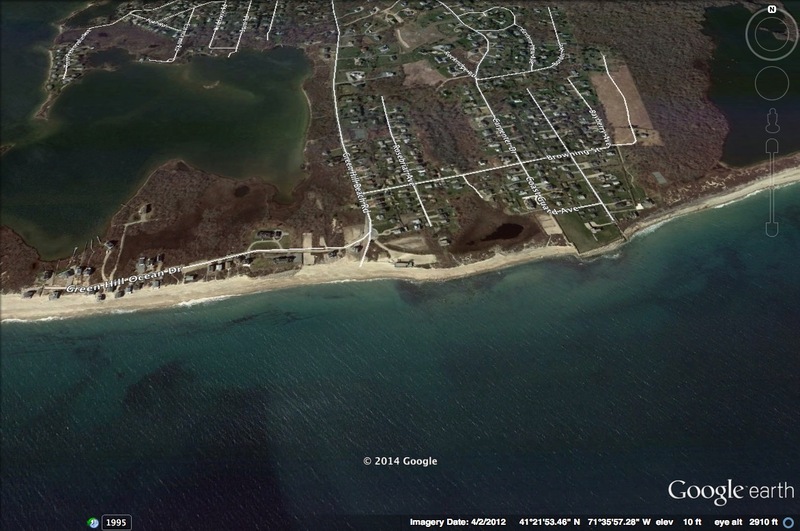 Again, looking at the Google Map of Green Hill Beach, you can see that there is, indeed, a pond behind that strip of sandy land. 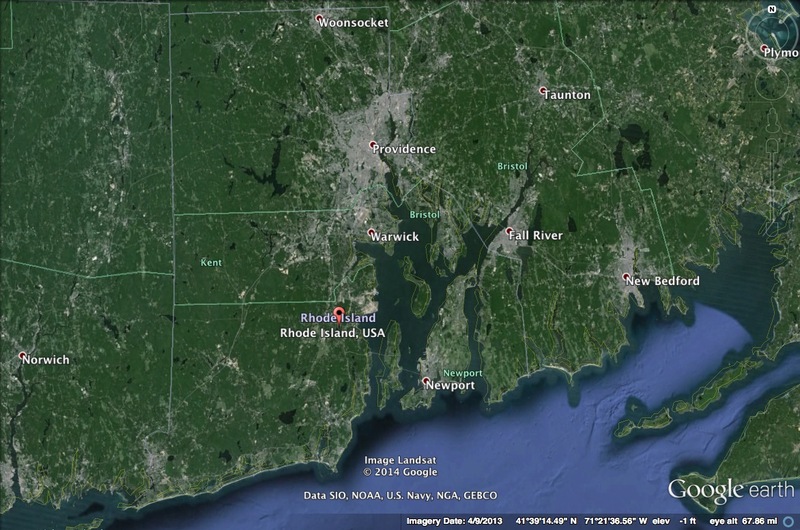 In fact, if you look at the Google Earth Map of Rhode Island (above), you’ll see that there are swampy salt ponds all along the south coast of the state. The Rhode Island court commended South Kingstown for its efforts and recognized the scientific findings that barrier beaches needed to be managed to protect inland areas. However, ultimately, they determined that the circumstances here resulted in a taking of Mrs. Annicelli’s land. As mentioned earlier, at the time that Mrs. Annicelli signed the agreement to purchase the land, there were already 30 houses built in the area. This mattered to the Rhode Island court because it meant the barrier beach had already been compromised. They also found that, in fact, the regulation had wiped all value from her land because the parcel was so small she would not be able to put it to any of the uses available in the ordinances. She had signed the agreement before the ordinance was passed, and thus she did not know she had purchased land that would be zoned in a way that would not allow her to fulfill her purpose. For these reasons, the Rhode Island court felt that an unconstitutional taking had occurred — unconstitutional in Rhode Island law as well as under the federal constitution. Note that the final decision was handed down in July of 1983. In all, it took 8 years before Mrs. Annicelli was told that either she could build her house or she would have to be fully compensated for her losses. Though I could not find documentation of it, my understanding is that Mrs. Annicelli finally built her house. Regardless, years later when I was working on research related to Palazzolo v. Rhode Island (another regulatory takings case that occurred along the south coast), I learned that Mrs. Annicelli’s case was well-known to Mr. Palazzolo. This connection has always intrigued me given that Mr. Palazzolo began his litigation odyssey while her’s was underway. Unlike her’s, his case made it all the way to the US Supreme Court — and that means his story will be another blog post on some future day.